Some of you may have noticed we’ve changed our look. Just a little. 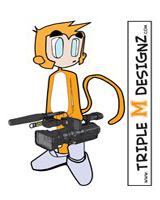 Not too far from our original Triple M Designz monkey, he’s now a little more current and is definitely what needed to freshen up our brand. In this world of eat or be eaten, you need to have a brand that stands out, otherwise, you’ll be forgotten. We are extremely happy with what we’ve come up with. You may also have noticed our business direction has changed too. We’re mainly focusing on videography because that’s just what we’re great at. Continuing to fuel the fire that burns bright. For those who still need graphic designs, don’t despair, we’re still making logos and other works of art. That department is not lost to us. We know how important it is and is still a great outlet for us to continue to be creative. Posted on June 30, 2012, in Multimedia & Designs, Music Videos, Projects, Promotions, What's New and tagged more videography, new logo, tmd new design, tmd new logo, triple m designz, triple m designz productions. Bookmark the permalink. Leave a comment.